After careful scrutiny the following candidates have been selected for contesting election. Please carefully follow the schedule for morning assemblies. Provide a policy and guidelines defining the aims and mission of its prefect system. Create awareness amongst students and staff on the management of school elections, ensuring fairness, equity and uniformity. Provide a code of conduct and eligibility for student candidates for prefect posts. Publish the above documents on all notice boards, in the first term. Publish the specific prefect posts, and terms of reference for each, including qualifications for legibility. Create and publish an appeal system. The appeal board being impartial, neutral persons. Punish those who contravene rules, regulations and codes of conduct after consulting the prefect board patron. Form an elections committee that shall include administration, staff and students. This committee shall be sensitized in the organizational procedures and conduct. Develop student council as part of the social tradition of the institution, with election activity included in the school calendar. Recognize that prefects are students, not workers, thus teachers shall cooperate with prefects as mentors, supporting, encouraging, guiding and counseling in order to develop sound leadership skills, social values and an orderly and fair school community. Appreciate that prefects cite a most difficult aspect of their position being humiliation from staff and administration that undermines their post and relationship with fellow students. Ensure that teachers and staff are adequately aware of their own role in mentoring prefects, giving due regard and respect recognizing the challenging duty they have undertaken. Academic record must be above average. Student must be registered in year four or lower six and have attended the school for >2 years. Self-confident: be bold and assertive. Ability to speak in public, to students and adults. Be polite, honest, reliable, punctual and hardworking. Demonstrable interest and ability in the area of the post applied for, be it health, sport, music. 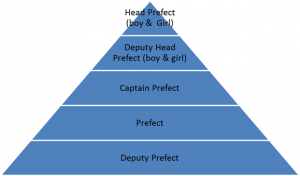 Prefects are ultimately responsible to the principal, level coordinators and prefect board in charge. On a day to day basis prefects are responsible to the concerned teachers as well. Prefects must adhere to School rules and regulations at all times. The main duty of prefects and dormitory captains is to maintain an atmosphere friendly cooperative, peaceful, discipline and unity in the school. Prefects should serve as councilors to junior students. Prefects must liaise and collaborate with each other, as a team, to ensure efficiency and smooth running of their own area of responsibility and of the school as a whole. Prefects’ academic and behavioral standards must be maintained. Prefects will always work in the interest of the school. All discipline notes from prefects must be reported to the Principal and level coordinators. Implementation of discipline is carried out by school authorities (e.g. Principal, Level Coordinator and Teachers). School authorities can use the services of prefects for supervision only. The student community is called to live together in peace and discipline, to respect the rights of each and every one in the community. Prefects shall carry a sash that distinguishes their office of service. 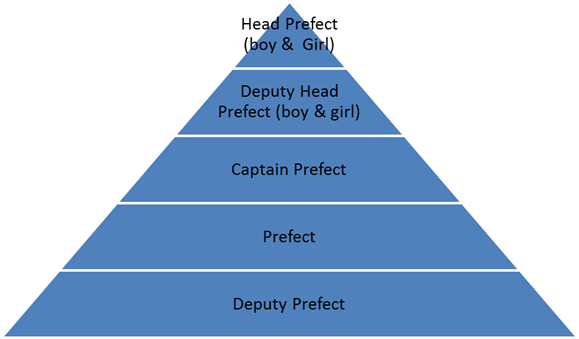 Each prefect shall have a document defining his/her area of competence, roles and duties. Prefects shall, in discharging their duty, act in love, assuming the role of senior brother/sister to the junior ones placed in their charge. The head prefect shall consult with the school administration on matters of policy, and sanctions. Prefects shall promote discipline in all their domains, coordinated by the head prefect. Prefects will ensure the smooth functioning of the school in matters of peace, order and discipline and strict respect of school rules and regulations without fear or favor. The school administration will arrange prefects meetings to improve renew and concert on matters affecting the day to day student life in the community. The prefects shall show integrity, who will teach by examples respecting the rules and regulations of the institution. The prefects will respect hierarchy, honor and obey their teachers and at no time will they bypass the administration. The prefects must give students appearing to have broken rules or regulations, an opportunity to give themselves a fair hearing, so they are corrected in love to avoid any future occurrence of the offence. The prefects shall not use their authority to their friends for favoritism. They will in all school activities lead and serve. The prefect will in everything represent the school image positively. He/she shall ensure the pursuit of academic excellence and orderly behavior. His/her moral and academic life shall always be a model for the student community to emulate. A Prefect is appointed by the Principal on the recommendations of the Senior Management team (Level Coordinator & Class Teachers) and other staff. It is expected that Prefects will demonstrate, in their everyday lives, all the values that the school upholds. To be a leader by example, within the student body. 21st Oct 2015 Announce elections Mobilization, awakening. Invitation to apply made in presence of all students in the morning assembly and through written circular after recess. Brief and encourage prospective candidates. available at election office (Prefect Room) Prefect board In charge will provide uniform information to all potential Candidates to apply. 28th Oct 2015 Publication of approved candidates. Transparency. applied for. Order and accountability. Code of conduct for campaigns posted in strategic areas of school. Any use of sweets, biscuits, intimidation is strictly forbidden. Unrealistic promises, character denigration, disciplined is not allowed. Candidates to meet students, adds colour to the school year, instils a culture of fairness, honesty, trust. Transparency and trust should be exercised. by election committee in presence of the chairman. paper opened by one person designated by the chairman Committee. That students know free and transparency and trust. That students know free and fair democratic practice. 6th – 12th Nov 2015 The four elected candidates will call a session of School council of 11 members within 3 days’ time to decide on the post of president and vice president posts in the presence of chairman. CODE OF CONDUCT FOR STUDENT ELECTION CAMPAIGNS. School rules are to be followed at all times, including any schedule for campaigning. Violations of rules and regulations and codes of conduct shall be punished. Campaign speeches will contain only attainable proposals, and no insults or criticism of opponents. Candidates and their representatives or supporters are forbidden to use any kind of intimidation, threats, materials, food or financial inducements, with the aim of influencing votes. In the case of a tied vote, a re-run will be held. If there is still a tie then the head of institution will have the casting vote. When a candidate runs for more than one position, and in their second or third choice turns out to be the only candidate the school authority must respect the student’s choice and make an appointment for the others. Any individual with a grievance concerning any aspect of the elections is free, and shall be encouraged to submit a written complaint following the school’s published appeal procedure. A standard application form should be produced, that all applicants must fill and submit to the election commission. It could include the following notes. How many years have you attended this school? Why do you want to be a prefect? Why do you want this particular prefect post? What is your class average? The results of 1st year, matriculation, AS and O levels etc. Attendance Record of previous two years. You must obtain TWO nominees to support you and sign your Nomination Form. The Nomination form must be submitted to the Election Coordinator by the deadline stated below. You will not be able to stand as a candidate if you miss this deadline. Describe at least three reasons for the suitability of candidate for the post applied. A sample ballot paper will be posted on the central notice board representing the official candidate list. Ballot papers will be printed, by election Committee, immediately the candidate list is produced. iii. One ballot paper will be required for each student – the correct number should be printed, otherwise some students may be unable to vote, or some to make multiple votes. POST ELECTION COORDINATION, MANAGEMENT AND SMOOTH RUNNING OF PREFECT TEAMS. Our prefect systems are to be treated part of the educational provision of SMA. We encourage students to be prefects, because it is a learning opportunity, a chance to gain skills and experience that serve as an additional qualification when they graduate. Research has shown that a majority of successful professionals, in business, management and other areas, participated in student government/Council while at school. Many young people confirm that being a prefect was difficult and challenging, but that they benefited later in life, through success gaining employment and posts of responsibility and leadership – they appreciate the skills they built as a result of being a prefect.